Whether you're hiking in the summer sun, or gearing up to bomb the mountain, this legendary pack from Burton is the perfect addition to all of your year round adventures. The Day Hiker 25L Pack features a lightweight design with a compression molded, highly breathable mesh back panel and a Cush ergonomic shoulder harness for epic all day comfort you can't deny. 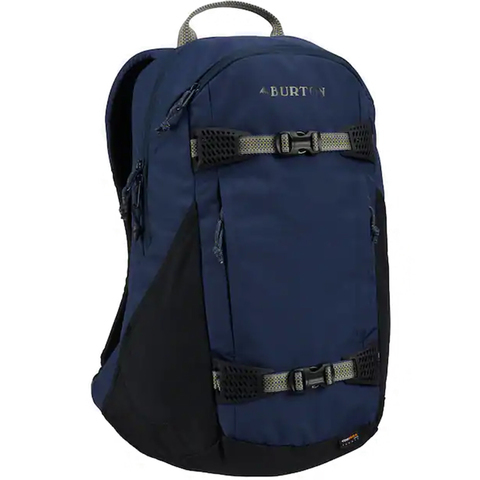 Material: Eclipse Colorway - 210 Carbonate PU coated nylon ripstop / 600D polyester with PU backing. Fired Brick Colorway - 500D Heathered nylon polyester blend / 840D Jr ballistic nylon. Golden Oak Colorway - 420D Nylon oxford with PU backing / 600D polyester with PU backing. Material: True Black Colorway - bluesign® approved 75D x 150D polyester ripstop with PU backing / 600D polyester with PU backing. Rifle Green Colorway - Polyester / cotton blend waxed ripstop /600D polyester with PU backing.